Performers include: Will Rothhaar, Jason Alexander, Malcolm-Jamal Warner, Daniella Monet, and Wendy Makkena. Sports talk show host and newspaper columnist Tony Kleinman (Jason Alexander) is held in high esteem by his fans. His home life is a different story. His family includes non-sports enthusiast and fundraiser wife Dana (Wendy Makkena), 15-year-old son and exceptional golfer Mickey (Will Rothhaar), and daughter Megan (Daniella Monet), who is 14-years-old going on 30. The Kleinmans day-to-day life frequently becomes material for Tony on-air and in print and the family members spend more time trying to hide their issues rather than try to solve them. Advising Tony on his home life and his big mouth is his radio show sidekick, Bernie Widmer (Malcom-Jamal Warner), a ladies man and former football star. 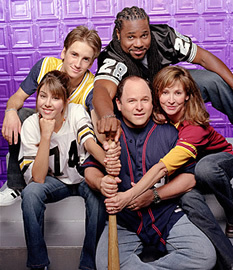 Based on the life of real-life ESPN personality and Washington Post columnist Tony Kornheiser, the sitcom features athletes like Doug Flutie, Dennis Rodman, Laird Hamilton, Brandi Chastain, Steve Young, and Eric Dickerson, as well as celebrities like Bob Saget, Penn and Teller, and Craig Ferguson.